My HOT TOYS collection begins! I am very pleased and satisfied with my Rey and BB-8 set. The detail is amazing. And the quality of work is fantastic. I'm hooked. 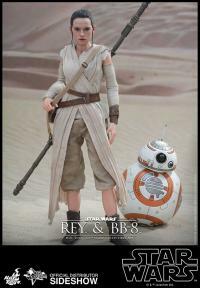 I'm already deciding which other products from HOT TOYS I will be purchasing. 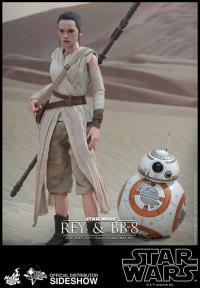 Just received my first Hot Toys Rey and BB-8 Action Figures today, and they are really amazing! The details in all the accesories are stunning. I love BB-8 and the eyes of Rey. Overall I am very happy to have bought this through Sideshow. 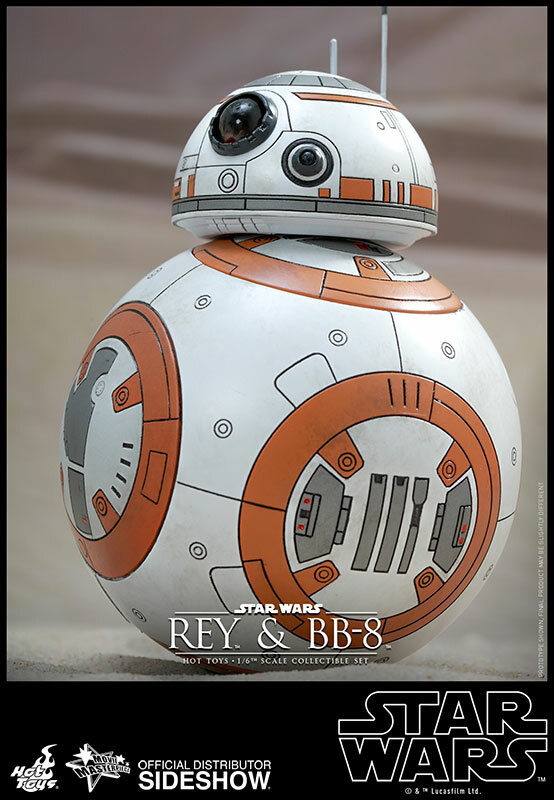 I love the amount of detail in both Rey and BB8. I bought her a companion piece to my Kylo Ren and she and BB8 don't disappoint. Cant wait till my Iron Man VI comes in! Really loving this set. Rey and BB-8 are 2 of my favorite characters from The Force Awakens so I HAD to have this and I'm not disappointed. Easy to pose and the detail on both are amazing. Awesome job from Hot Toys on this one. 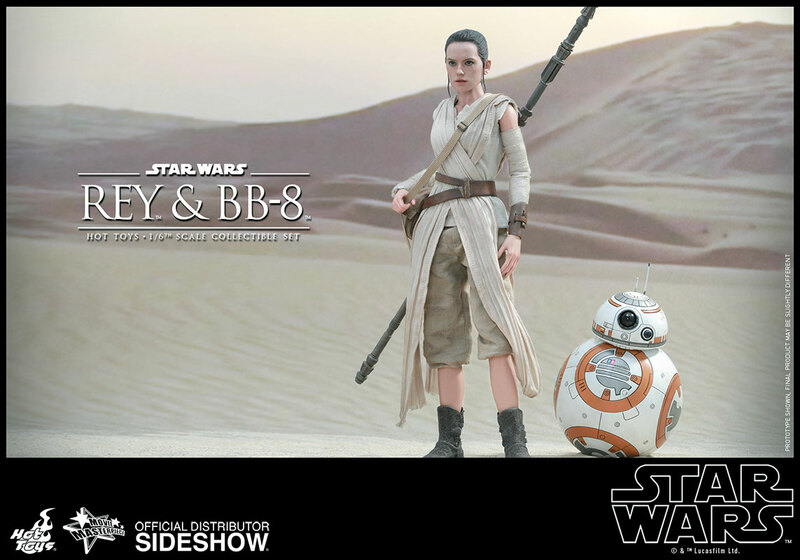 Rey and BB-8 look fantastic. I love that you can put Rey into so many different poses, so I'll be switching out her look every few months. Amazing job Hot Toys, another home run. Thank you Sideshow for distributing this amazing figure. My first hot toy and now I'm hooked. It looks amazing and it's the perfect size for display options. Awesome figure set! I really felt Rey came to life in this figure. Just great detail all around. As my first collectible, I now feel I have a piece of my favorite franchise. Big thanks to you guys and your team for making this a reality! Keep doing what you do best! Force is strong with this. Just received my Rey and bb8 set and am very happy. 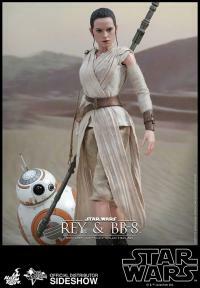 The attention to detail is stunning and the Rey face sculpt is spot on. Quality oozes as soon as you open the box and the bb8 figure is a quality piece that is nice and heavy due to inner workings. I recommend buying the set for top value 10/10. Wow!!! Really pleased with how this figure looks compared to the prototype shown on the order page. The face sculpt is excellent and met or exceeded expectations. Highly recommended!!! If you love Rey and know she saved The Force Awakens, do not hesitate to order this gorgeous figure with BB-8. This is a great set. BB-8 is beyond expectation and Rey is awesome. Only issue it the batteries are hard to get in such a small compartment with the magnet. Great Job overall!! LOVE IT!! Highly recommend. This is my first Hot Toys and i absolutely love this figure! The detail in the clothing is amazing and the fact that Rey gets a her scavenger gear just adds to the value. BB-8 also sealed the deal for me. Overall i am happy to have bought this and look foward to buying from Sideshow Toys soon. Loved how she came out !! Her outfit and accessories were great. 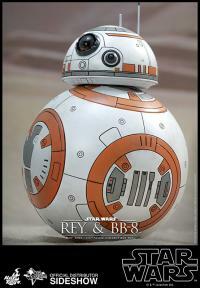 BB8 is cool too just very hard to get his battery compartment open. Overall a great set.